All along this sparkling stretch of Brittany, where the likes of Salma Hayek and François-Henri Pinault, Hugh Grant, and Catherine Deneuve are said to vacation, historic towns like Dinard and St.-Malo are shedding their stuffy reputation to become a discreetly stylish getaway for in-the-know travelers. Môle Beach, in the town of St.-Malo, France, which is surrounded by historic fortifications. "That's where Chateaubriand was buried, standing up and facing out to sea," said our skipper, Nicolas, as we boated past a small rocky island off the coast of Brittany. It wasn't hard to see why the French writer demanded a sea view. This stretch of shore in northern France is known as the Côte d'Émeraude, or Emerald Coast, and it more than lives up to the poetic name. These transparent, blue-green depths alone were enough to entice me and my husband over from London for a long weekend. That morning, we had left Castelbrac, our hotel, in a handsome, 40-foot wooden speedboat at 9 a.m. — perfectly timed for an onboard breakfast of coffee, warm viennoiserie, baguettes with local Breton butter, and a pot of chocolate-hazelnut spread. After passing Chateaubriand's burial site, we made our way back to the seaside resort town of Dinard. There, we encountered the Hitchcockian outline of a single villa on the cliff, tall and statuesque, looking down over a pale yellow arc of sand. Dinard is dominated by a trail of these grand, Belle Époque houses, which stud the cliffs on either side of the town like something from an Edward Hopper painting. Nicolas pointed out a huge walled house on the far side of the bay where Salma Hayek and François-Henri Pinault are said to spend their summers. 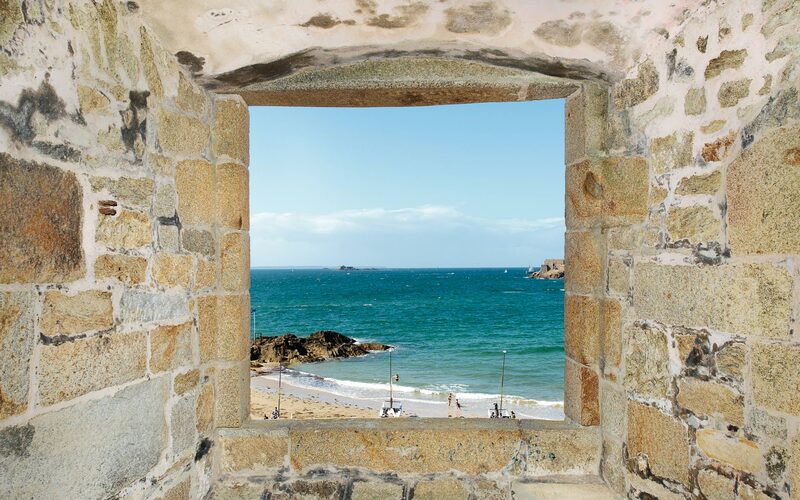 Once an unassuming fishing village, Dinard was "discovered" by a group of aristocratic English sea-bathing enthusiasts in the mid 19th century. 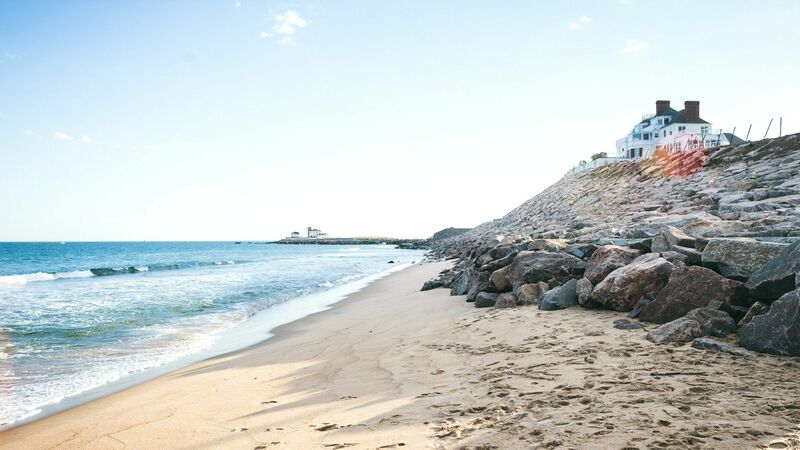 These expats built the first cliff-top villas in the area and invited their wealthy friends to do the same, quickly turning Dinard into one of France's first real seaside destinations — this despite Brittany's famously hit-or-miss weather. Even today, the town retains a British air; English accents can be heard in the daily market, and a statue of Alfred Hitchcock, once a frequent visitor, looms over the bay. From left: The pool at the Castelbrac hotel, in Dinard; a villa above Dinard’s Écluse Beach; Castelbrac’s Salon Charcot lounge. The majority of the discerning, monied types who holiday in Dinard wouldn't dream of setting foot in St.-Tropez. Too flashy, too "m'as-tu-vu," as they say. They are less interested in Louis Vuitton, more in the understated goods for sale at Renouard, a low-key leather store that has been in business since 1891. And rather than sunning themselves on terraces and people-watching, these visitors prefer to picnic on the sand, first stopping by one of the many boulangeries for a fresh baguette, then La Belle Iloise, a local institution, for sardines and beautifully packaged tins of fish pâté. Though this corner of Brittany has some of the finest sandy beaches and clearest seas in France, the likes of Catherine Deneuve and musician/model Lou Doillon can still stroll along the esplanade freely without fear of being snapped on an iPhone. The scene is stealth wealth at its most alluring. Until recently, unless you were a lucky house-guest at one of the villas, Dinard had little to offer in the way of high-end accommodation. There are still a few seaside hotels big on slightly dilapidated Breton charm. At one, the Hôtel Printania, the waitresses wear Breton bonnets like women in Gauguin's Pont-Aven paintings, and there remain a few lits-clos — wooden box beds with shutters, originally designed to allow parents a little intimacy in the times when families all shared one room. And there is the Grand Hôtel Barrière, part of France's ubiquitous Barrière hospitality group, where Hugh Grant is reported to stay when he flies over to play the famous golf course at St.-Briac-sur-Mer. But the new Castelbrac hotel has been a game changer for Dinard, proving that for all the town's colorful history, it doesn't need to be stuck in the past. An extraordinary architectural mix of castle, mansion, and Art Deco ocean liner, Castelbrac traces its roots to 1865, when it was built for the Fabers, an aristocratic English family. Later, the villa was owned by a Crimean War hero named Colonel Hamilton, who dubbed it "Villa Bric-à-Brac" in honor of its mishmash of architectural styles. In 1934, France's National Natural History Museum purchased the home and turned it into a marine-research station and aquarium housing tanks of sea horses and conger eels. Seven years ago, a businessman named Yann Bucaille bought Castelbrac with the intention of turning it into a luxurious small hotel. He insisted on preserving the eclectic look, from the tiled Arts and Crafts fireplaces to the round windows of the former aquarium, originally added to let natural light into the fish tanks and now the defining feature of a cool, nautically themed bar. It is this sensitivity to the building's history, combined with stylish interiors by Paris-based designer Sandra Benhamou, that makes Castelbrac so unusual — and so full of fun discoveries. One morning I stumbled upon a 46-foot-long pool set high above the ocean, so narrow it could almost be missed. Not far from the bar, I found a small nondenominational chapel, newly installed by Bucaille as part of his vision for the hotel as a "Soul Haven" designed to nourish the senses. A view of Môle Beach. Castelbrac's arrival has also coincided with the opening of several boutiques that wouldn't be out of place in Paris's fashionable Marais district. While exploring Dinard on foot one day — the sky was gray, but the sea was still that startling emerald — my husband and I concentrated on the cluster of streets just up from the beach. Here we passed an array of stylish storefronts: boutiques stocking Saint James's famous striped fisherman's sweaters; Papa Pique et Maman Coud, an upmarket accessories boutique for mothers and daughters; Lindfield & Co. Fine Teas, which sources the finest brews from Sri Lanka, Japan, and China; and L'Atelier M Chocolat, an artisanal chocolate shop run by a husband-and-wife team. Equally charming were the well-coiffed residents, popping out for their morning coffee, air-kissing in the road, and dashing about before everything closed for lunch. Because in Dinard, if you miss the restaurants' lunchtime window between noon and 2 p.m., you'll have to go without. Luckily, the more touristy town of St.-Malo was able to cater to demanding visitors like us. After a 10-minute ferry ride and a quick glance at Le Fooding, the go-to online guide for restaurants in France, we discovered that two of St.-Malo's most happening restaurants are located on the same street. Rue de l'Orme, a narrow road in the historic center, is home to La Maison du Beurre, a purveyor of artisanal dairy products owned by Jean-Yves Bordier, who still makes butter the old-fashioned way, using a wooden paddle. Next door is Bordier's butter-focused restaurant, Bistro Autour du Beurre, and opposite that, by a trendy buckwheat shop selling everything from pasta to cookies (buckwheat is a celebrated mainstay of Breton cuisine), is Le Comptoir Breizh Café. Here, the Japanese and Breton staff have given the space an Asian twist with décor reminiscent of a Zen wood-paneled sake bar. We perched on barstools, surveying the slick open-kitchen operation while wolfing down tsukemono (Japanese-style pickled vegetables) and perfectly crisp buckwheat galettes. Despite all this modernité, the narrow streets of the walled city made me long for our calm, airy bedroom across the water. My husband and I decided to call it a day. After taking the ferry back to Dinard, however, we suddenly got hungry and headed out for our third meal of the day at Le Café Rouge, a buzzy, beloved seafood brasserie where we ate pink prawns, house-made mayonnaise, and delectable frites. No visit to Dinard is complete without seeing St.-Malo, we agreed over our bottle of Pouilly-Fumé, but only if you come right back. Take the TGV Atlantique fast train from Paris Montparnasse to St.-Malo. The ride is about two hours. Castelbrac What was once an Englishman’s estate and aquarium is now a luxurious hotel with nautical décor and a 46-foot outdoor pool. Dinard; castelbrac.com; doubles from $334. Bistro Autour du Beurre Chef Steve Delamaire incorporates Bordier butter in many of his dishes, including the catch of the day and farmers’-market finds. lebeurre​bordier.com; entrées $20–$27. L’Atelier M Chocolat Christophe Moreau opened this chocolate emporium only two years ago, and it is already making waves with its divine macarons and chocolate-shortbread creations. Dinard; fb.com/atelier.mchocolat. Le Café Rouge The vibe at this Dinard bistro is laid-back, and the seafood is dependably delicious: think baskets of juicy prawns with a side of salty frites and house-made mayonnaise. fb.com/lecafe​rouge​dinard; entrées $21–$69. Le Comptoir Breizh Café The classic buckwheat galette has received an innovative Asian twist at this peaceful, Japanese-style crêperie. St.-Malo; breizhcafe.com; entrées $5–$16. Le Printania Dine at this near-century-old waterfront Dinard hotel, where the waitresses wear bonnets and the seafood is top-notch. printaniahotel.com; entrées $16–$30. La Maison du Beurre Jean-Yves Bordier is famous for his award-winning cheeses and butters. Grab one of the beautifully packaged blocks to go with your baguette. lebeurre​bordier.com. La Maison Générale A high-end furniture store in St.-Malo. From contemporary Italian furniture to Philippe Starck lamps, there is something here for every taste. lamaisongenerale.com.